What Is Cardboard Boat Building Challenge? 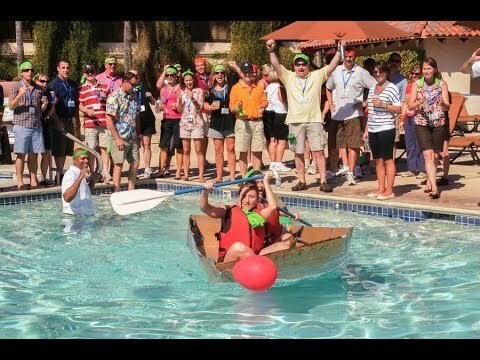 Cardboard Boat Building Challenge is a hands-on activity available anywhere in North America, any time, and for any group size. This creative activity challenges teams to design, construct, and test boats made out of nothing but cardboard and tape. Climb aboard your vessels to go head-to-head in aquatic challenges! Overall, this was the best team building event we have ever done because it was challenging, fun, and creative. We all laughed together and got to know each other on a more personal level, which has brought us closer together as a group. Everyone had a great time doing the actual boat building and the racing of the boats at the end. Groups were fully engaged and everyone had an integral part of the teams’ success. Overall, this was the best team building event we have ever done because it was challenging, fun, creative, and everyone was in the same basic area so we could see what each group created. The cardboard boat building was a huge success! Our group came away from that activity full of energy and everyone had nothing but rave reviews. Great team work activity and lots of laughs. Would highly recommend it to all types of groups and of any age. Thank you for a wonderful team building activity. Want to Learn More About Cardboard Boat Building Challenge? All aboard! It’s time for the Cardboard Boat Building Challenge!